In a medium-sized bowl, whisk olive oil, chipotle chile, adobo sauce, juices, zest, brown sugar, and spices. 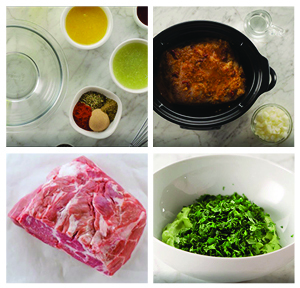 Place the pork shoulder into a gallon sealable plastic bag and cover with chipotle marinade. Refrigerate eight hours or overnight. Place pork, marinade, diced onion and 1/4 cup water in slow cooker. Cook pork for 8 hours on low, or until tender and falls apart easily, about 180 degrees. Transfer pork to a large bowl, shredding with two forks. Toss with remaining marinade from slow cooker. Combine avocado, sour cream, heavy cream, lime juice and salt in the bowl of a small food processor fitted with a blade attachment. Process until smooth, occasionally scraping down the side of the bowl. Transfer to a small bowl. Stir in cilantro until fully incorporated. Fill separated lettuce leaves with pork, top with sliced radishes, crema, and cilantro.